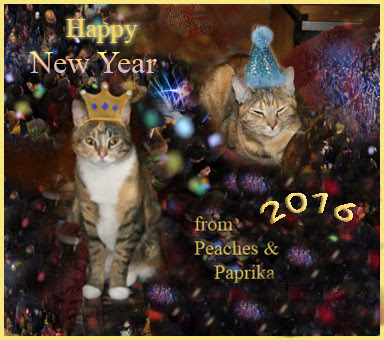 Peaches and Paprika: Happy New Years Eve! Happy New Years Eve sweet friends! Wow, you both look so festive and very ready for NYE! Sending you wishes for a wonderful 2016. Happy New Year! Hope you stop by for Feline Art Friday. Happy New Year to you lovely ladies! Awww...you 2 look adorable. Happy and healthy 2016 to both of you and your Mom too! XO I look forward to meeting you in 2016. We purray yous New Year is blest. May all your heart's desires come to you with ease and glory in 2016...Happy New Year! Will do, Julie! Thanx for the invite! Thank you Flynn, you have been a wonderful virtual orange boyfriend! Same to you!